I went through a phase a few years ago where I became obsessed with knitting. I took a short online course where I learnt the basics of knitting which turned out to be really useful. Since learning how to knit, I went a little crazy spending every spare bit of time I had knitting scarves and little bits here and there. (You know how it is when you go through a phase). It really helped me to get used to it and learn how to perfect it. (If you asked me now to knit something I'd probably struggle, it's been a while)! I made scarves for my niece and cousins it was all quite fun. Eventually I ended up having loads of unfinished knitted bits and bobs. I literally had knitted squares just flying all over the place and ended up making nothing out of them! That my dear friends, brings me to this post, as I was rummaging through my old stuff back at my mum's house, I came across this lovely glittery knitted piece of something! I fell in love with the sparkles all over again and thought I must have it in my new home! And luckily, because I love my lovely readers, I thought I'd turn it into a DIY for you guys, so you can all see how to make a cushion out of this. With the help of some spare bits of fabric I had lying around I managed to make it into a zip-less cushion. 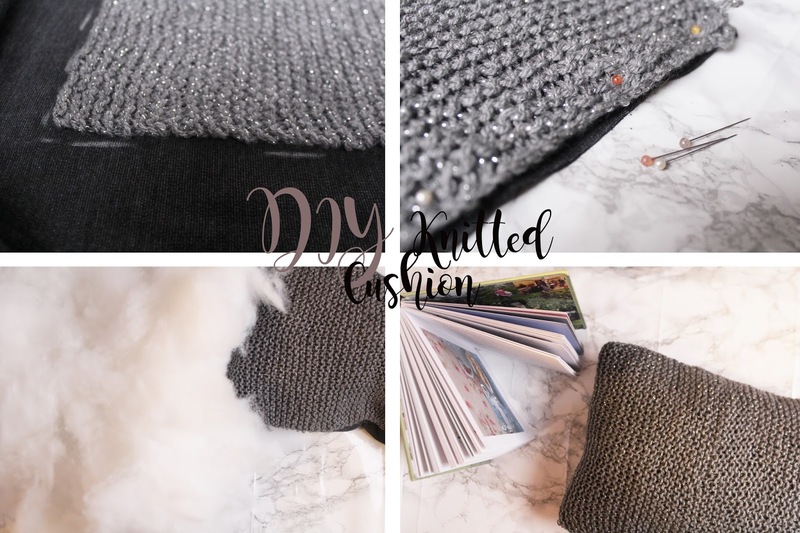 A ZIP-LESS cushion because at this moment in time, I couldn't be bothered with all the hassle that comes with sewing a zip on so I'm going to show you guys how to sew it without a zip and trust me it's so much easier! By the way guys, you can make any cushion like this, it doesn't just have to be a knitted one. Step 1. Lay your knitted piece down onto your fabric piece and mark around the edge with your chalk so the front and back are the same size. Step 2. 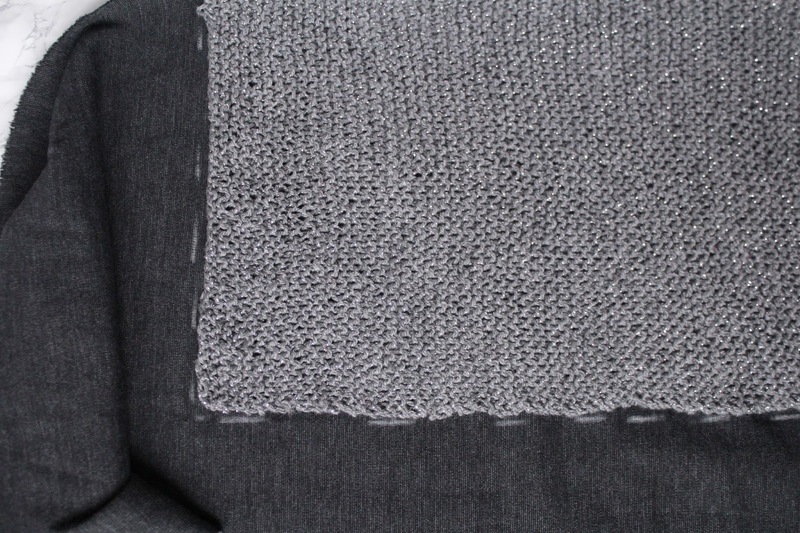 Make sure you have two layers for the reverse side of your cushion, one of the layers will line the knitted size to make sure it doesn't over stretch. Pin them both down and cut on the chalk marks. Step 4. Sew around all 4 edges leaving around 10 cm open to stuff it with the poly-fill. Step 5. Now with the second side of your fabric, sandwich the knitted piece in between and sew around the edge leaving the same 10cm open again in the same place. Step 6. 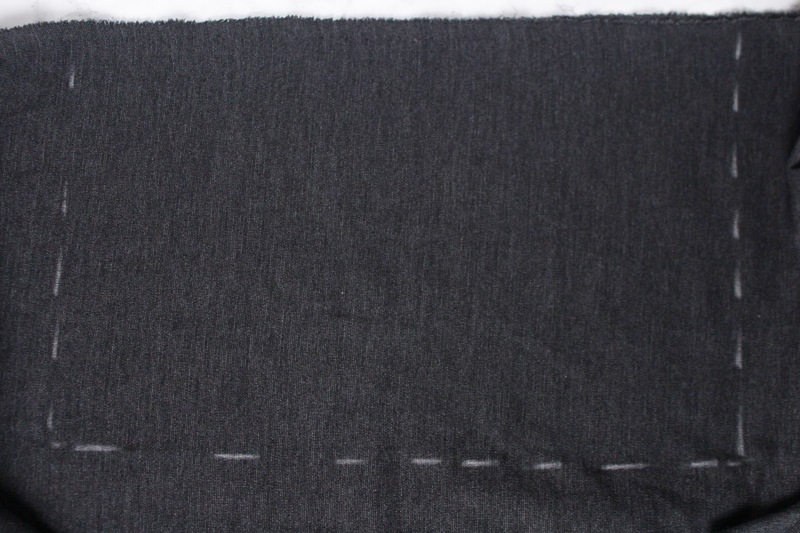 Turn your fabric back to the right way around and you should have most of the hard work down, phew! Step 7. It's time to get stuffing! Using your poly-fill, stuff your cushion until you can stuff no more so it's lovely and plump! Step 8. Lastly, after you have stuffed til you can do no more, get your needle and thread and sew up the last 10 cm which is still open, you'll have to do this super neatly though for none of the stitches to show.